It may be the dog days of summer, but questions to the iTunes Guy are still coming strong. This week, I look at three questions. I explain how to move an iTunes library to an external hard drive, I look at how to tag Christmas specials of TV series, and I discuss the pros and cons of ripping CDs in WAV and AIFF formats. Q: Is there a way to move my iTunes library to my external hard drive? Yes, indeed. And I’ll even give you two solutions to consider. Depending on the content in your iTunes library, you may prefer one or the other. 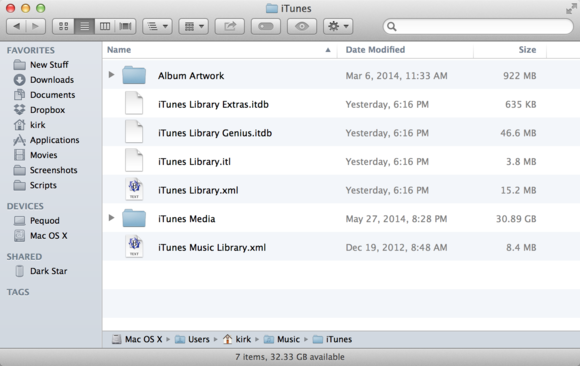 First, however, here’s an overview of the files that iTunes uses. If you go to your home folder (the one with the house icon and your user name) and then the Music folder, you’ll see that this contains an iTunes folder. Here are the contents of the iTunes folder. If you want to move your iTunes media to an external hard disk, the only item you want to move is the iTunes Media folder. Important: Be sure to leave all the other files where they are. To make the move, back up your files first, then follow the lengthy procedure explained in this Apple support document. Do exactly what it says, or you may find that your library doesn’t get moved correctly. But you may not actually need to move the entire iTunes Media folder; you may simply want to move, say, your videos and podcasts. You can use the $15 TuneSpan to move any items to an external disk in such a way that iTunes can find them. I wrote about TuneSpan a couple of years ago, and since then it’s added lots more neat features. If you want to move part of your library, it’s the safest way to do so. Q: I’m ripping box sets of TV series to add to my digital library, and some of them have a “Christmas Special” that comes between one season and another. Is there a way to tell iTunes this episode is a one-off special and have it categorized as such? This is annoying. A lot of British series do the Christmas special thing; Downton Abbey, Doctor Who, and many others. There are so many that there’s even a long Wikipedia page listing them. 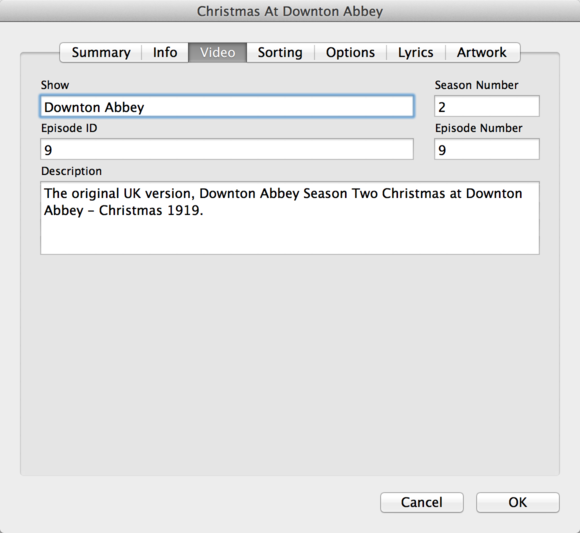 The iTunes Store tags Christmas specials as part of the preceding season. I would just increment the episode number, but keep it as part of the same season, the way the iTunes Store does. Then note in the title that it’s a Christmas special as there’s no way to tag it as, for example, season 1.5. Q: I want to rip my CDs in the best possible format, and have chosen WAV. Is there any difference between ripping in WAV or AIFF formats? There is a difference, but not in the actual audio data that the files contain. When you add music files to your iTunes library, you tag them—you enter song, artist, and album names, for example. You may also add album art to your files. The problem with WAV files is that they don’t store these tags, or metadata. (AIFF files do save some metadata, but not all, and not all apps can read it correctly.) Your iTunes library stores this metadata, but if you move the files, or temporarily remove them from your iTunes library, you’ll lose the tags. Your best bet would be to rip your CDs in Apple Lossless format. This has several advantages. First, it correctly stores tags and album art. Second, Apple Lossless files are about half the size of WAV or AIFF files. And, finally, since it’s a lossless format, you can convert these files to WAV or AIFF if you ever want to, or to another lossless format such as FLAC.